The Kitsap County Council for Human Rights on Friday hosted a conference tackling the school-to-prison pipeline, a term that encompasses the lower graduation rates and higher incarceration rates of minority, low-income and special-needs students. Speakers at the conference touched on many of the topics the Kitsap Sun addressed in our February series on evolving thinking about discipline nationwide and locally. Articles and blog posts in the six-day series are collected here. Students of color are more likely to be suspended or expelled than their white peers, according to discipline data shared at the conference by Tim Stensager, director of data governance for the state’s Office of the Superintendent of Public Instruction. The same is true of low-income and special-needs students. And the conference touched on the high rates of incarceration, homelessness and suicide among LGBTQ youth. Big data is being used to identify districts where disproportionate discipline is particularly evident, and the federal government is wielding a hammer over those that show a widespread, persistent or egregious pattern of discrimination. But the consensus a the conference was that the solutions lie at the local and even personal level. Everyone — school staff, students, parents and perhaps most importantly members of the community at large — needs to chip away at the problem from wherever they stand. Kelsey Scott, a Running Start senior at Central Kitsap High School, didn’t need the data to understand that black students are viewed as “different.” Scott has had fellow students question why she speaks “proper” and isn’t “rude.” Scott talked about how the bar for black students is set at once pathetically low, yet impossibly high. She is a hard-working student who avoids parties, yet she feels pressure to avoid any kind of trouble. Durell Green, 30, of Bremerton spoke at the conference about his personal experience with the school-to-prison pipeline. A self-described book “nerd,” Green got bored and acted out in elementary school, earning the label of “disruptive,” which dogged him at every turn. First arrested at 14, he was sent to Walla Walla at 18. Today, Green works to pay back the community through work in a mentoring program at his church. — Teachers must develop relationships with students, especially the troublesome ones, many at the conference agreed. Lack of time is not an excuse, according to retired educator Patricia Moncure Thomas; it’s part of the job. — Clearly teachers need support. That’s where the value of community mentoring programs come in. The nonprofit Coffee Oasis has been successful with outreach and mentoring of homeless and at-risk youth, said Daniel Frederick of the organization. It’s a daily battle, and it’s not easy but “There’s a story behind every single child.” Partnering for Youth Achievement, the program Green works in, and Our GEMS (Girls Empowered through Mentoring and Service), a program Scott found helpful in her life, are other examples. Boddie, who has led youth mentoring groups in Central Kitsap School District, said such programs must hold students accountable, and instill a sense of pride, respect and integrity. 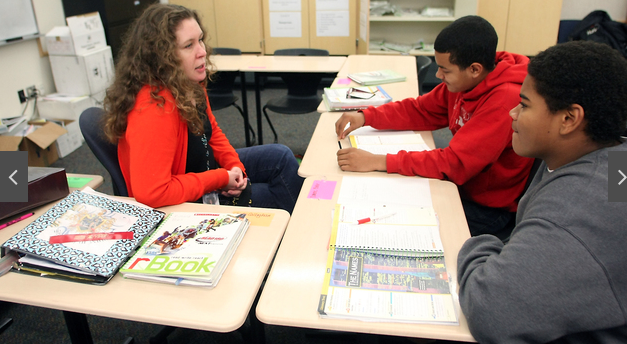 — Many districts, including Bremerton and Central Kitsap, are training staff in “culturally responsive” teaching methods. Teachers and other school staff who lack understanding of cultural norms and values, may misinterpret students’ behavior or miss opportunities to connect. Boddie said locally Bremerton and CKSD are ahead of the curve in addressing the role of a cultural divide in the school-to-prison pipeline. — While big data can diagnose the problem, schools and districts with local control are best suited to fix it, according to Joe Davalos, superintendent of education for the Suquamish Tribe. The tribe’s school, open to non-tribal members, has 80 students and weaves cultural knowledge in with academic learning. Expectations are high, defying data on Native American students. At the Suquamish school, 100 percent are expected to graduate, Davalos said. — Districts locally and nationwide are moving toward discipline that has students take personal responsibility for their behavior and make amends. So called “restorative justice” brings the offender face to face with who he’s harmed; solutions are hashed out in person. As we continue to cover the issue of student discipline, I’d welcome hearing from you about topics you’d like covered or experiences (positive or negative) you’ve had with local schools. Find me on Facebook, email chenry@kitsapsun.com or call (360) 792-9219. Thanks. The sympathy card was one you might expect to find at the store, were it not written on white paper and drawn with a blue ball-point pen. 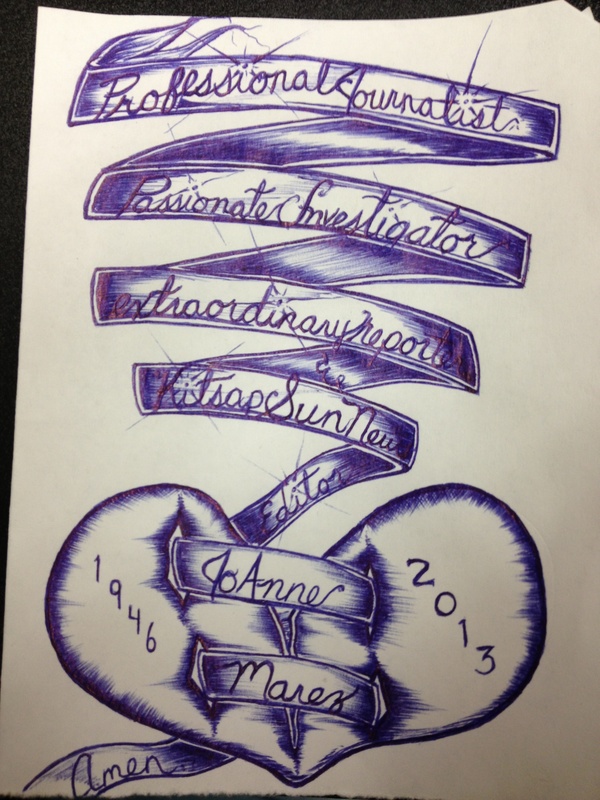 “In Loving Memory … & you will remain in Our Hearts … forever…” its inside reads. The card came from Robert “Doug” Pierce, currently an inmate at the Kitsap County jail. He was paying respects to JoAnne Marez, a longtime reporter, editor and — frankly — a legend here at the Kitsap Sun. Marez died earlier this month due to complications due to an infection. She was 67. I am at this point uncertain whether Pierce had help in the artistry that graces the cover of the card. In any event, in the detail you can see in the photo, Pierce calls Marez a “Professional Journalist, Passionate Investigator, extraordinary reporter, Kitsap Sun News Editor.” It’s quite illustrative as well. Pierce, you may recall, actually solved a vexing math problem a few years back, untangling an error in how the Kitsap County jail was calculating its time off for good behavior, or “good time” for short. He is serving time for third-degree theft, trespassing and bail jumping, according to court documents. As someone who toiled for years in the world of Kitsap County’s criminal justice system, I think JoAnne would’ve been touched by the card. I’m going to see to it that it gets to her family.